Rural Wisdom is a 5 year community development and shared learning project based at Outside the Box that explores the impact of community-based activities that are led by older people living in rural areas. It has been designed to benefit people across the UK. 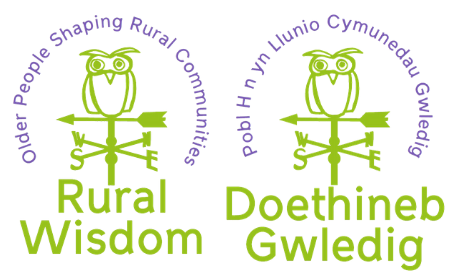 For the last 2 years Rural Wisdom has been working in Aberfeldy and Kinloch Rannoch in Highland Perthshire, the Brechin and Edzell area in North Angus, Eaglesham and Waterfoot in East Renfrewshire and in Wales, Leeswood and Pontblyddyn in Flintshire and the area around Milford Haven in Pembrokeshire. People in Borders asked if they could be one of the Rural Wisdom Stage 2 areas so at the end of November 2018 with support from Borders Care Voice we held a Get Together in the MacArts Centre in Galashiels to start planning for Rural Wisdom in the Scottish Borders. We talked about what we have been hearing from people during stage 1, it was thought much of this rings true for the Borders also. We also talked about solutions to challenges that people here are finding which could be shared with other places and how Rural Wisdom can complement and support activities and planned developments in Borders. More information can be found here in our Get Together report. For the next 6-9 months we want to hear from and talk to different groups, communities and people in Borders who have an interest in making communities better for older people as we know there are lots of good things happening in the Borders. In the summer of 2019 we will review what we have heard and decide how Rural Wisdom can work in Borders. Please invite us along to groups, meetings, events or anything you think will help us speak to the right people.